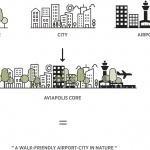 Masterplan that creates the world`s first 100% walk-friendly connection between an international airport, nature and urban city functions. 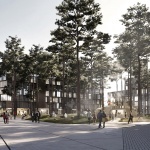 Aviapolis is a large urban district flanking the Helsinki International Airport (Airport City Aviapolis) and a part of the municipality and the City of Vantaa that is a part of the greater Helsinki metropolitan area. 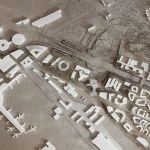 The Aviapolis Core area is located next the railway station and the City’s ambition is for it to become the most dense, mixed and accessible area in Aviapolis. 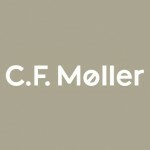 As a starting point the area will be home for 1,000-2,000 inhabitants and 10,000 jobs. 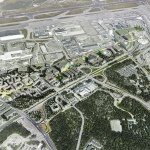 The Aviapolis Core area will run alongside the Helsinki international Airport. The area is defined by urban city functions through which a 100% walk-friendly pedestrian lane called The Strip will run. The Strip will start from the future terminal 3 building as an elevated pedestrian lane with urban green characteristics, hovering above the logistics of the airport´s infrastructure. This 2-level logistic division turns the Airport’s departure & arrival point into the world’s first walk or bike connection between an international airport and city functions – walk home or enjoy city functions as a short-time visitor. The Strip lands on ground level and runs through the core area with various city functions docking on along it’s 1,8km southbound span. The Strip runs like a river through campus areas, parks, squares, commercial functions, housing and nature, connecting with public transport and easy accessibility to traffic. The Strip becomes a destination itself with its lively 24/7 urban space activated by a series of urban nodes such as a forest plaza, a campus park and a transportation hub along it’s pathway. 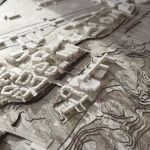 The vision of the masterplan is to merge the existing elements of nature, city and airport into one single urban organism and to create attractive synergies between the unique mix of the user groups: visitors, residents, students, working people and artists. 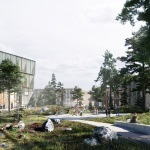 A green and socially sustainable pedestrian city connecting the world with Finland.